Bruce Lee gave so much advice in his relatively short time as a professional martial artist and fitness instructor. Fortunately he left many notes and journals that have now been made into books, so that we know a lot about Bruce Lee training methods and philosophies. Bruce Lee divided his routine into specific martial arts training to enhance his martial arts prowess, i.e. weight training, calisthenics, cardio fitness and stretching. If you combine this Bruce Lee workout with a fitness plan you will get excellent results very quickly. Each day Bruce Lee would train to improve his physique and his martial ability. However, Bruce Lee also stated that it was important to never train the body so hard on any given day, to the point where the body is too weak on the following days to train more or to fight. From a martial perspective it is essential to never over-train, as although in the long term intensive training can make the body stronger quicker, in the short term it is not a good martial practice to leave yourself weak to fight. Here we look at his weight training routines including isometrics, his abdominal workouts, we take a brief look at his cardio routines and stretching. Finally we present a review of The Art of Expressing the Human Body, a fantastic book that provides so many insights into Bruce Lee’s life and training. First we take a look at his training philosophy. There is little doubt that if you follow in the footsteps of Bruce Lee, training as hard as he did and eating a nutritious and healthy diet like Bruce Lee, then you will quickly master your own body and never have any weight issues again. One thing is certain, and that is Bruce Lee knew how to exercise very effectively, to the point that he had zero body fat. He was in amazing shape, and Bruce Lee weighed around 141 lb (64 kg), and was 172 cm (5 ft 8 in) tall. Note, his BMI was 21.4, which is mid-normal. What he lacked in fat he made up for in pure muscle! Losing weight is easy with a Bruce Lee style workout. This quote is still valid for all forms of weight training exercise today. Firstly, good form is essential, whether you are lifting weights, stretching, performing bodyweight exercises or practising martial arts. Bruce Lee obviously had a very good grounding in the importance of good form, as kung-fu, and other martial arts, use “forms” for training and honing fighting techniques. Good form is essential in martial arts, as it can help to determine the strengths and weaknesses of a student, condition the body to react and move in the correct way, as well as strengthen the muscles, ligaments and joints. Poorly executed form can lead to poorly executed martial application, which can be fatal. Bruce Lee was interviewed on the Pierre Berton Show in 1971. The interview starts with the the question of Bruce Lee making films in Mandarin, when he can only speak Cantonese. Surprising, in the early Bruce Lee films the voices are dubbed, as the early Bruce Lee films were first shot without sound. “To me, a motion picture is motion. You gotta keep the dialogue down to a minimum” Bruce Lee, 1971. Then they discuss the secret of the success of the Big Boss, namely that it broke the mould because the fighting was real. Bruce talks about how martial arts has deep meaning to his life – and that martial arts have shaped all parts of his life. “Martial Arts include all the combative arts like karate, Judo, Chinese kung-fu, Aikido .. some have become sport, but some not, such as kicking to the groin, jabbing fingers to eyes.” Bruce Lee, 1971. Bruce then talks about his theory of the “art of expressing the human body“. Combining instinct and control to have harmony, to prevent either becoming mechanical or wild – unnatural naturalness, or natural unnaturalness. “Under the sky, under the heaven, there is but one family. It just so happens that people are different” Bruce Lee, 1971. At the end of the video he talks about how style is meaningless, and that he does not teach style. Everyone has two arms and two legs, so for fighting, style is only restrictive. In the end of this part Bruce Lee talks about “The Warrior”, and how martial arts are relevant in Westerns, but not the modern world, as now people carry guns. In the Bruce Lee Workout, form is very important. Poorly executed form not only reduces the effectiveness of an exercise, but it can also cause injury by placing too much pressure in the wrong areas. Also, to cheat on an exercise, is to cheat your own body of obtaining the optimal workout during any given session. Bruce Lee’s weight training routine evolved during his career. In his early days, his emphasis was on traditional martial arts workouts and bodybuilding, especially forearm training, and he supplemented his diet with protein drinks. Later on, he started to simplify his training. He realized that rather than the isolation exercises favored by bodybuilders, he needed to perform compound weight training exercises to increase his overall strength and condition. Bruce Lee’s weight reduced after he gave up the bodybuilding routines in favor of more traditional compound and cardio training. This quote is interesting, as it seems to move away from his traditional approach of not working the body so much that you are weakened. So, although he was moving away from the bodybuilding routines, he was also moving away from pure martial arts. The Bruce Lee Workout should be intensive enough to require adequate recovery days. Bruce Lee suggested that you should train at most once every other day, or three days per week, with an extra rest day at the weekend. For Bruce Lee, the most important aspect of his new weight training routine was that he could still train his martial arts and practice endurance/cardio training on the other days. Bruce Lee adopted a cross training methodology, in that he believed fitness training should have three key elements: stretching for flexibility; weight training for strength; and cardiovascular for endurance. Cross training became a key element in Bruce Lee workouts. This Bruce Lee workout helps you to build explosive strength and power. Bruce introduced the concept of strength training for martial arts to many people, especially to those in Hong Kong, who would only use traditional martial arts training. The clean and press is a classic weight lifters exercise. Unlike bodybuilding exercises, which work muscles in isolation, Bruce Lee’s weight lifting/power lifting exercises work muscles together, i.e. they are compound movements. Bruce Lee performed clean and presses in a very intensive fashion, that is, without rest between reps. This made the exercise a cardio and endurance exercise as well as a weight training exercise. In the clean and press a barbell is lifted from the floor, and in one explosive movement the weight is lifted up to rest on the front of the shoulders – this is the clean. Afterwards, the weight is then pressed upwards, and held overhead. It is then lowered to the floor in one movement, and repeated. A good form is essential in the clean and press, it is also important not to attempt to lift too much weight, as injuries to the lower back are common in poorly executed clean and presses. The squat is one of the most important compound exercises in the Bruce Lee Workout, especially for martial artists. It develops a solid base and core. In the standard squat, which should always be performed in a squat rack for safety, a barbell is placed across the shoulders and a squat is then performed. Bruce Lee advised there should be no pause in the lowest position, instead as soon as your thighs reach a horizontal position, you should rise again to a standing position. The squat works the hips, glutes, hamstrings, calves and quads. The barbell pullover is a weight training exercise that is less common these days. It is the classic rib-box expander. To perform a pullover you should lie on a flat bench, hold a barbell with a shoulder width grip overhead, and then lower it backwards behind your head, keeping the elbows slightly bent. The bar should be held as far back as it is comfortable. Some people can touch the floor behind them with the bar, but this is not recommended without adequate training. Use a light weight to start with, as this is a deceptively difficult movement. No weight training session would be complete without a bench press. Many martial artists actually advise against the bench press as it expands the rib cage, which is a weakness in fighting. 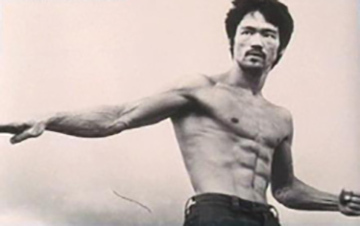 Bruce Lee taught that a fighter should aim to develop a solid set of ribs, which can take strikes. Performing many bench presses and pullovers can open the ribs too much, so if you plan to fight competitively, do not place too much emphasis on these exercises. Bruce Lee was a fan of the good morning exercise. The exercise involves holding a barbell across the shoulders and then bend forward, keeping the legs and back straight. This exercise can be very dangerous if you do not warm up and attempt to use too much weight. Really good mornings can be performed with good results with just an empty bar. Bruce Lee damaged his back doing good mornings exercises – he did not damage it in a kung-fu challenge match, as portrayed in the film Dragon! Curls are the other staple weight training exercise along with bench presses. Everyone seems to want bigger biceps. For martial arts styles that involve grappling, grabbing, pulling and throwing, a good pairs of guns come in very useful. So perform bicep curls in each training session to build up the guns. Bruce Lee Workout aims to increase your pulling power. With any weight training, it is important not to get into a rigid routine. After a while of training, you will hit a plateau and training will no longer produce the same gains, if any, that it once did when you were weaker and less fit. For this reason, it is essential to add new exercises. So, train with dumbbells instead of barbells at times, change the weight and number of repetitions etc. to give the body a new challenge and a new spurt of growth. Bruce Lee adopted many different exercise workouts during his short but intensive martial arts career. Although he became famous for his well chiseled muscles, which were once compared to warm marble, he also used many exercises derived from more traditional kung-fu training, which involve holding a weight steady for a period of time. Possibly the most famous kung-fu isometric exercise is the horse stance, which is simply a squat that you hold. Sounds easy, try it. This Bruce Lee workout routine is a simple routine using 8 different isometric exercises. Each exercise is performed just once. The aim is to work to maximum effort in each exercise for 6-12 seconds. To perform these Bruce Lee exercises you need a power cage or a similar weight training bench with a bar that is too heavy to move. If you have enough weights you can put them all on a bar so that it is too heavy for you to lift. This can actually aid your training, as rather than knowing it is impossible to move the bar, you can tell yourself that if you push harder, you may move it! Press Lockout. Set a bar in a power cage at about 3 inches below your lockout position for a shoulder/military press. Grasp the bar as you would normally for a press, and then push the bar upwards as hard as possibly for 6 to 12 seconds. Press Start. This is the second position for the press. Start with the bar at chin height, just above the lowest position on your usual military press. Exert maximum force for 6 to 12 seconds. Rise on toes. Set the bar in a position just above your shoulders where you can touch it enough to apply pressure when on tip toes. Then position yourself under the bar, rise on toes, and push the bar as hard as possible for 6 to 12 seconds. Pull. The bar is set in a similar position to where you start an upright row, just below waist level. Stand in front of the bar and with a shoulder width grip, pull it upwards as hard as possible while also rising on your toes for 6 to 12 seconds. Parallel Squat. Set the bar at the lower position of a barbell squat at the point where your thighs are parallel to the floor. Position yourself in the usual squat position and then try to lift the bar as you would in a squat. Push as hard as you can for 6 to 12 seconds. Shoulder shrug. Position the bar in the power cage at the start of the shoulder shrug position, so that you can grab the bar but with the shoulders down. Then with all your effort attempt to perform a shoulder shrug. Deadlift. The isometric deadlift is performed with the bar about 2 inches below your knees. Then perform the usual deadlift with your feet set shoulder width apart, hips down and back flat, pushing as hard as possible with the legs and pulling up for 6 to 12 seconds. Quarter squat. The second squat position. Set the bar about 4 inches below your standing position in a barbell squat. Position yourself, and then push upwards on the bar as hard as possible for 6 to 12 seconds. See weight training exercises for descriptions and guides on performing these. As you can see, in principal the exercises are easy. All are performed for 6-12 seconds. Remember that you are aiming to work to failure still, in that you will be putting so much effort into pushing or pulling the isometric bar that by the time your reach 10 seconds your muscles should be screaming in pain. To perform these isometric exercises well you need to first really learn the moving versions, as form is very important and unless you have performed squats and deadlifts before, you may position yourself incorrectly resulting in a muscular injury. Bruce Lee always emphasized good form over brute force. If you perform these exercises with maximum effort then one set of these exercises may be enough for you. Do not underestimate how much work the muscles are doing in not moving an object. Your body will be attempting to get all of your muscles to work together to move the stationary bar. Isometric exercises should not replace other weight training exercises. Remember also that diet and nutrition are vital to strength and muscle development. What makes this type of training so different is that you only have your body and willpower to listen to. Nothing moves, you just push and sweat! If Bruce Lee said it worked for him, then there is a good chance that it will work for you too. Bruce Lee himself often used to comment on how he worked out on his abs. In doing so he helped other people build their own. Bruce learnt how to build abs from champion bodybuilders, and spent many years perfecting the art of abdominal development. He believed that the abs were vital to provide balance and strength in the body. Do not sit up and down like a see-saw, but curl your upper body up starting with your head, then neck, then chest. Keep your abdominals engaged (tensed) and your attention focused on them at all times. Do not simply go through the motions. Most importantly, Bruce Lee taught that abdominal exercises never reduce the waist, i.e. there is no reduction in fat. For this, diet and nutrition is key. Lee firmly believed that proper nutrition was essential for developing the perfect set of abs. What you eat determines the thickness and density of the outer tissue covering the abdominal muscles. Once the excess fat has been worked off through a calorie controlled diet combined with aerobic and endurance fitness training, the abs are then relatively easy to maintain through a good healthy diet and regular abdominal exercising. Jeet Kune Do – The Way if the Intercepting Fist. Just in case you’ve never heard of this guy, check out Tommy Carruthers at Facebook…according to Bruce’a first and best student, the late Jessie Glover, Bruce fanatic Tommy is the only guy he has ever come across with similar explosive speed and power as Bruce. Watch him at YouTube or at Facebook … he runs a school dedicated to Bruce’s fighting methods near me in Glasgow, Scotland.